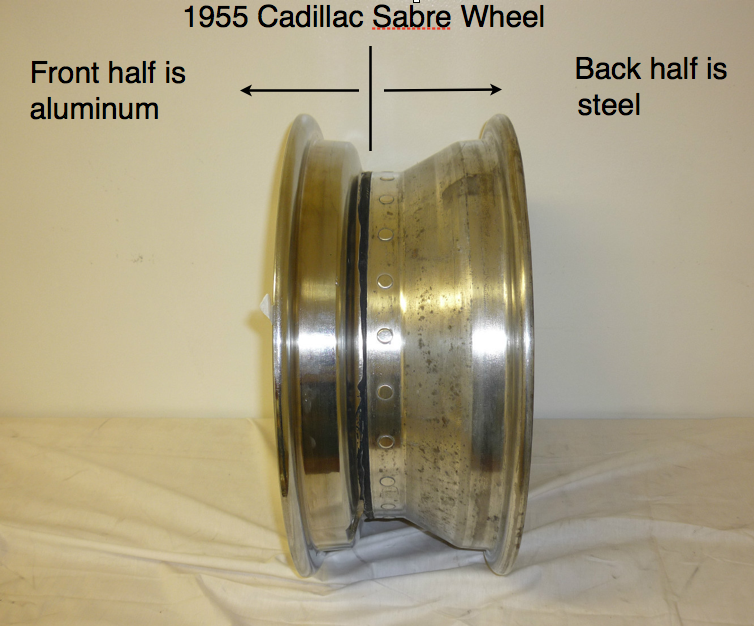 In this article we will cover the history, evolution & application of the Sabre wheels in chronological order from 1955 to 1958. First introduced on the 1955 Cadillac Eldorado. 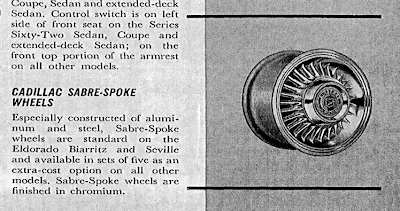 The Sabre wheel was the first aluminum wheel used on any modern passenger car. 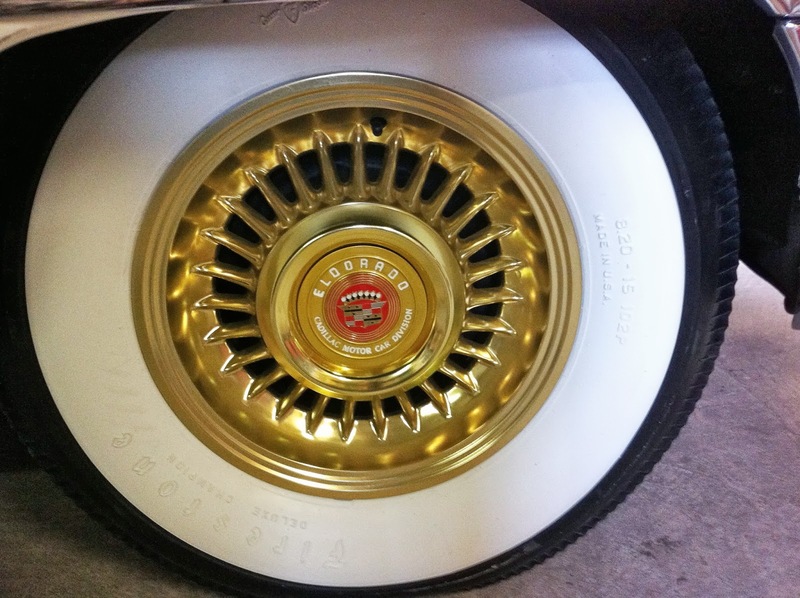 It took the collaboration of two well established companies to bring this wheel to market. 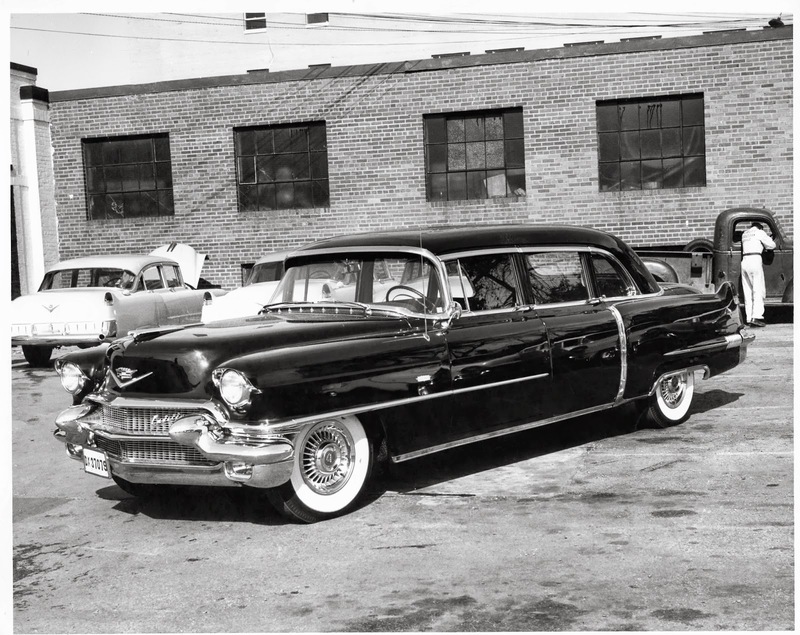 The first is Alcoa Inc., at the time Alcoa was OEM for various aluminum parts found on Cadillacs. 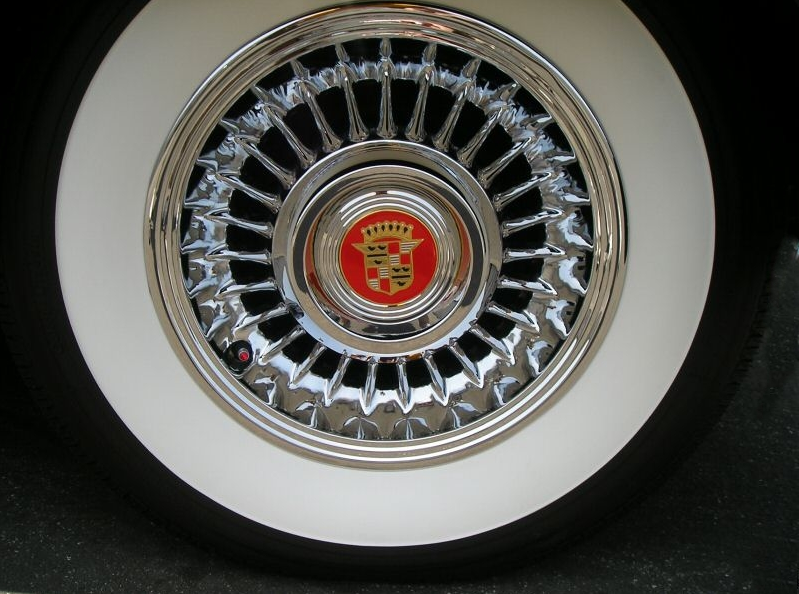 The second company was the Kelsey-Hayes Wheel Corp. At the time Kelsey-Hayes was OEM for the 53-54 Eldorado wire wheels. 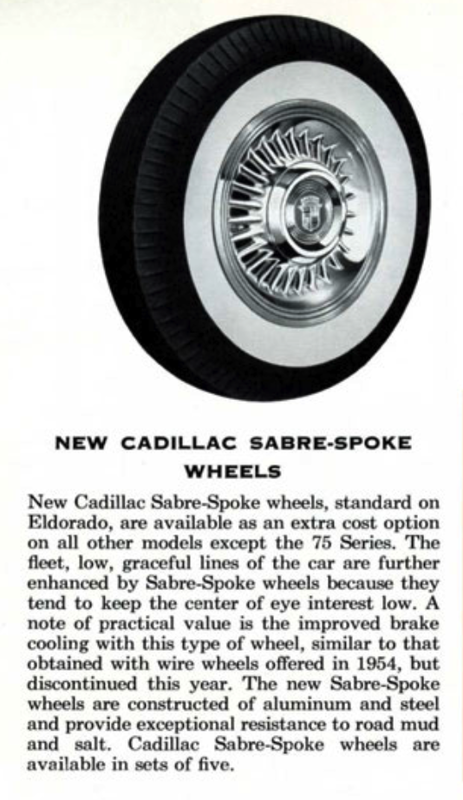 1955 Cadillac Data Book Introduction of the New Sabre Wheel. 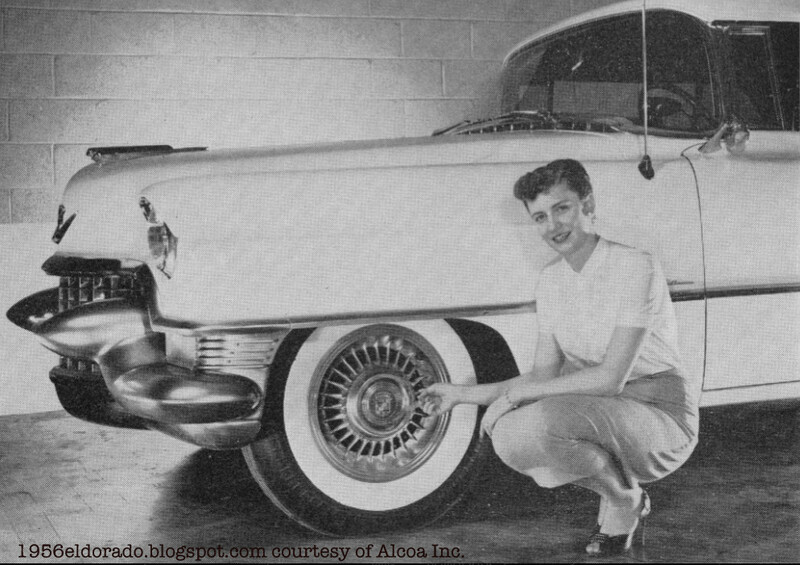 Our first look at the Sabre wheel installed on a 1955 Cadillac is this photo from the Alcoa archives. It's hard to make anything stand out when your backdrop is a 1955 Cadillac but I think Alcoa did the best they could by having a model point out the great looking new wheels they offered. The 1955 Sabre was not available for the Series 75 cars according to the 1955 dealer data order book. It probably had to do with the extra weight of the car. 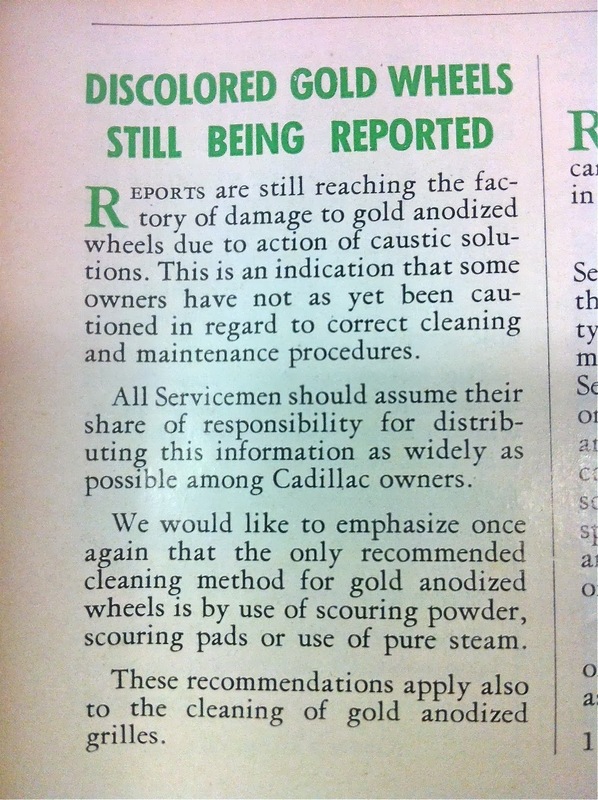 1956 Cadillac Data Book Introduction of the Sabre Wheel. 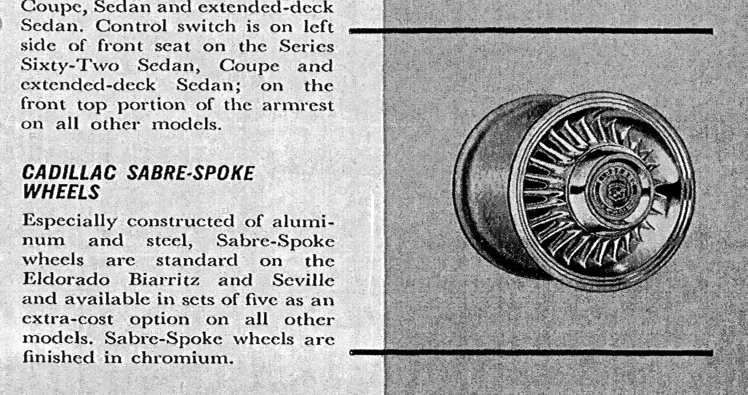 The Sabre wheel was redesigned for 1956. The split wheel design was changed to a clad rim. This made the rim stronger and allowed for a tubeless tire. This is another first in the automotive world. 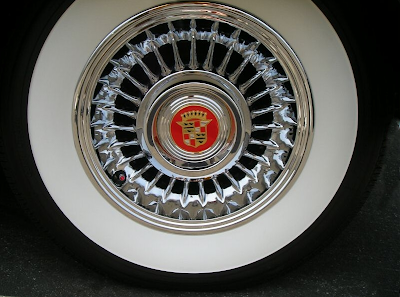 The '56 Sabre became the very first tubeless aluminum wheel. 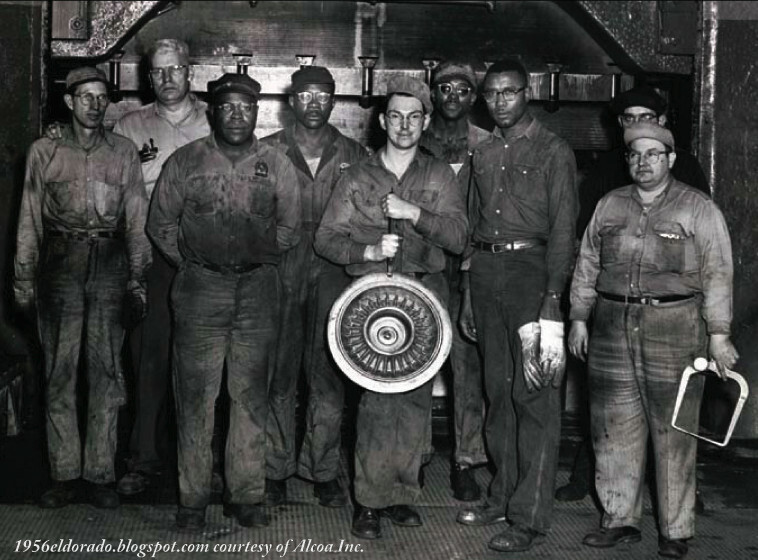 Here is a picture of the very first forged 1956 Sabre wheel made at the Alcoa plant. 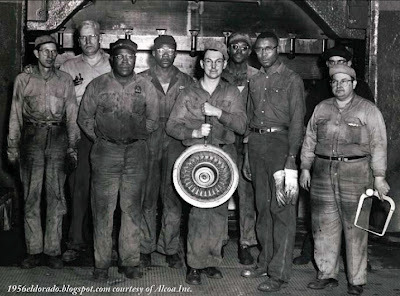 The Alcoa workers are standing in front of the giant press that forged a hot block of aluminum into the shape that we all know and love. What's a clad design you ask. It's a full steel rim with an aluminum hub riveted to the rim. The follwing pictures should clear it up. Because of this design, the wheel is sturdier and requires only half the numbers of rivets to assemble. Therefor a tube is not required for the tire. The '56 and up Sabres are now available on the Series 75 cars as well. 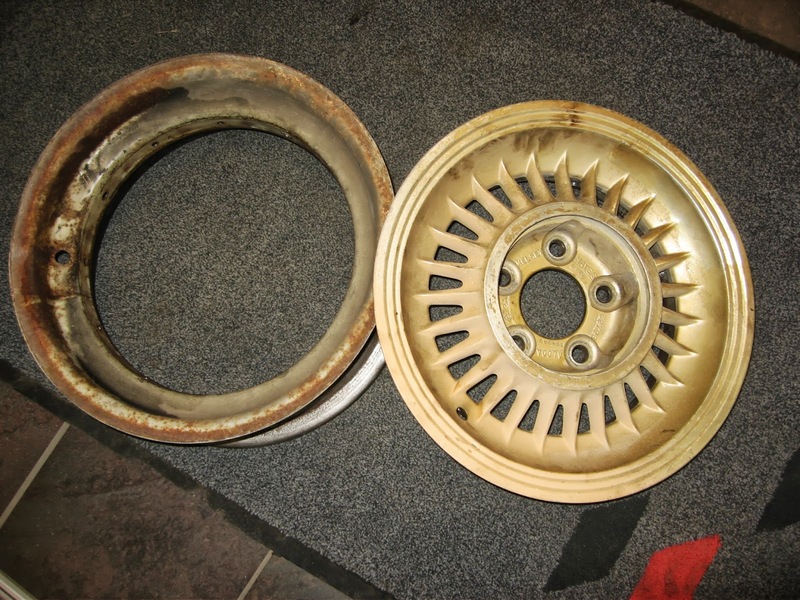 They were not the same part number as the Series 60/62 wheel. This fact makes the Series 75 wheels the rarest of all Sabre wheels. Here is a very rare look at a Series 75 with sabre wheels. 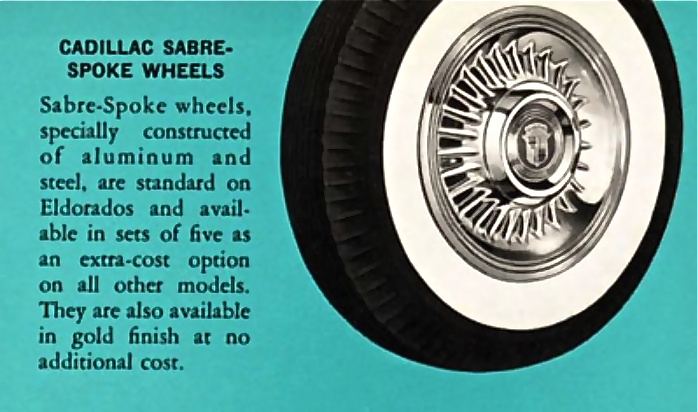 Also new for 1956 and 1956 only, was the gold sabre wheel. The gold was an anodized finish. It looked great but was problematic for the general consumer because the finish was easily damaged if aggressive cleaners were used. 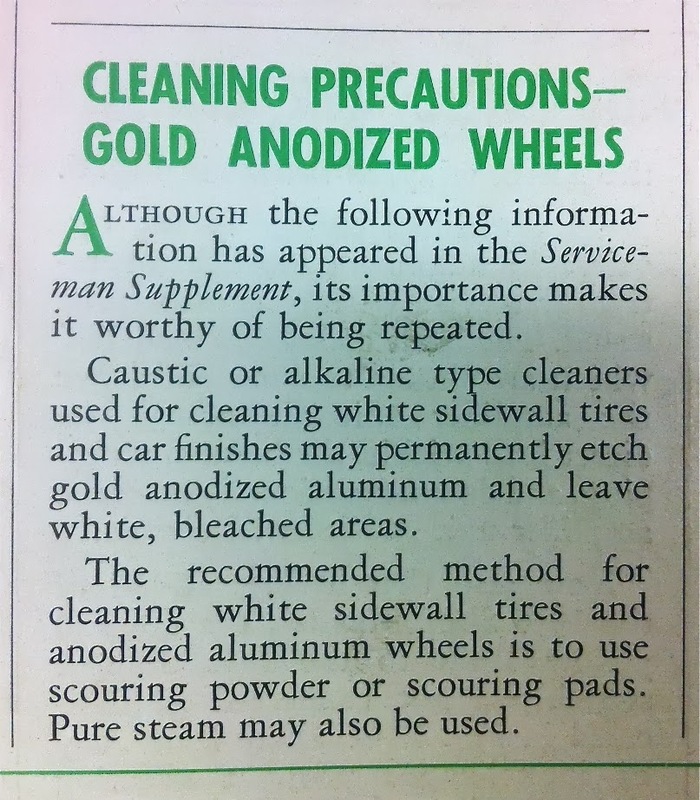 For this reason the gold sabre wheel was discontinued after 1956. Cadillac must have received many complaints about the discoloration of gold wheels. 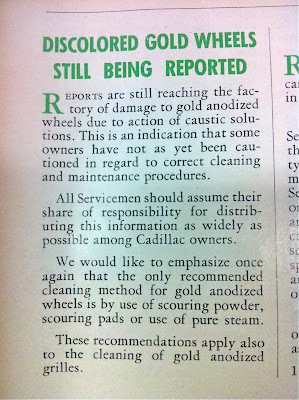 This problem was mentioned more than once in the Cadillac Serviceman issues for 1956. April 1956 Serviceman. Another reminder. Click to enlarge. 1958 Cadillac Data Book Introduction of the Sabre Wheel. 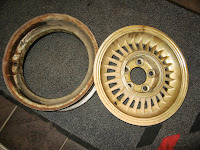 This wheel was the same construction as the '56 wheel. 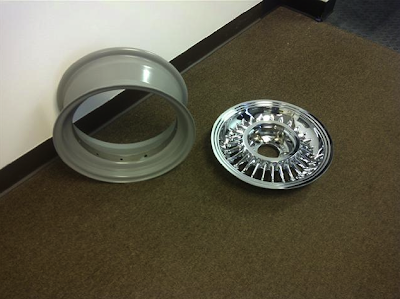 The only difference was the steel rim. 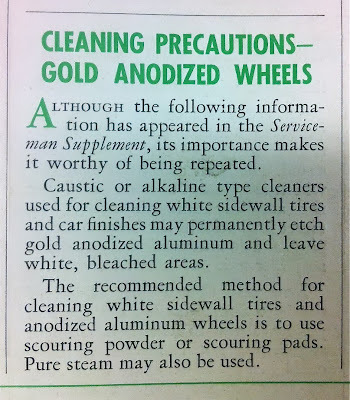 It was altered slightly to allow the rim to fit over the new shape of the brake drum found on the 1957 and 1958 Cadillacs. The gold wheel was no longer available. Special thanks to the folks at Alcoa Corp for their help with this article.